The IWC Portugieser Chronograph is one of the most successful watches ever produced by this Schaffhausen-based company. Highlights from this series include 18-karat gold watches powered by an in-house caliber with a flyback function. The Portugieser Chronograph is one of the most popular models in the Portugieser collection. Its history goes back to 1939 when two Portuguese businessmen requested IWC make a wristwatch as precise as a marine chronometer. Sailors used marine chronometers to determine their position at sea. Before these chronometers were developed, ships often lost their way or had accidents. Wristwatch movements hadn't yet reached chronometer-level precision by the end of the 1930s, so IWC put the pocket watch caliber 74 into a wristwatch case. Thus, the first generation of Portugieser watches was significantly larger than its contemporaries with a case diameter of 41.5 mm. At the time, smaller, square watches in Art Deco style were the trend. Today, larger watches are the norm and are even trendy for women. The design of the first Portugieser was clearly ahead of its time. IWC produced only a few hundred of these large pocket watch wristwatches up until the 1980s. In 1993, IWC introduced a new edition of the timepiece under the name Portugieser. It quickly developed into the Swiss manufacturer's most successful series. In 1995, IWC premiered the first Portugieser chronographs. The name references the historical origins of the timepiece, and these roots are preserved in its design. A simple dial, thin hands, an alligator leather strap, and a gold case are typical features of classic dress watches, like the Portugieser Chronograph. It also has a stopwatch function for timing. A stopwatch function is more commonly found with sport watches like the Rolex Daytona or the Omega Speedmaster. Both of these timepieces have a close connection to car racing. The term chronograph means "time recorder." The first proper chronographs displayed the recorded time on a dial similar to an odometer. Modern chronographs display the timed period of time with hands. Usually, they have a central chronograph seconds hand and subdials for the timed minutes and hours, depending on the timepiece. The standard Portugieser Chronograph can time up to a maximum of 30 minutes. Thanks to the fine stick indices on the dial edge, you can even time to 1/4th of a second. The watch with reference number 3712 is a double chronograph, meaning you can separately time two events of different lengths. Are you looking for a stylish, yet functional dress watch from IWC? Then you should take a closer look at the Portugieser Chronograph. Its simple, sleek design goes perfectly with a suit. The chronograph function can be used in many different situations. For instance, you can time your next presentation to make sure you don't go over your allotted time. Pre-owned Portugieser Chronographs are available for around 4,000 euros. New models cost more, about 5,000 euros. The price for a pre-owned gold version is much more, however, at 8,000 euros. New gold watches cost around 12,000 euros. Pre-owned stainless steel models with a split-seconds function cost around 7,000 euros. Gold versions are more expensive at 10,000 euros. 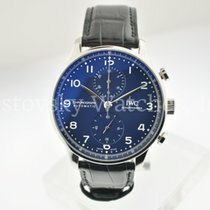 Since IWC doesn't produce these double chronographs anymore, there are almost only pre-owned models available. In very rare cases, you can find a new Portugieser with this function. With a diameter of 40.9 mm, the Portugieser Chronograph is a good fit for almost every wrist. The Classic Chronograph model is a bit larger with a diameter of 42 mm, making it an appealing option for those who prefer larger watches. Its case is also 2 mm thicker than the standard version. It's powered by the in-house caliber 89361 with a flyback function. This allows you to reset the chronograph hand to zero without having to stop it first. The three steps of "stop," "reset," and "start" are all combined in one button. New stainless steel models cost around 8,000 euros. The 18-karat red gold versions cost around 17,000 euros new. The Portofino is a good alternative to the Portugieser. IWC introduced the watch in 1984, naming it after an Italian town near Genoa. The former fishing village is a popular meeting place for the well to do. The Portofino series reflects the attitude of the rich and beautiful. Pre-owned Portofino models with an automatic caliber, three hands, and a date display are available starting at 1,500 euros. The prices for new models begin around 3,000 euros. An IWC Portofino Chronograph is available for 3,000 euros pre-owned and 4,000 euros new. The IWC Portugieser Chronograph has a simple, timeless design. The case is made of either stainless steel or 18-karat red or white gold. The model with reference number 3714 has a moderate case size of 40.9 mm. You have the choice between a silver, black, and ardoise (slate) dial. IWC uses Arabic numerals for hour markers and small dots for minutes. There is a second track on the edge of the dial to measure timed seconds and fractions of seconds. Using the second track, you can time down to 1/4th of a second. A subdial below 12 o'clock serves as the 30-minute counter, and the small seconds subdial is located at six o'clock. 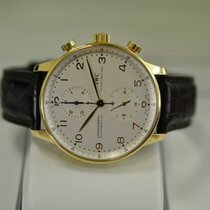 The inscription "IWC Schaffhausen" is at three o'clock, while "Chronograph Automatic" is written on the dial at nine o'clock. The Portugieser Chronograph has a very clean and simple dial layout. The scratch-resistant sapphire glass is domed and has double anti-reflective coating. You have the choice between a black, brown, and blue alligator leather strap. The automatic caliber 79350 ticks away inside the Portugieser Chronograph. It's based on the ETA Valjoux 7750, which is one of the most successful automatic chronograph movements in the world. It's considered to be very precise and robust. The movement has a 44-hour power reserve and a stop-seconds mechanism, allowing you to set the watch to the exact time. IWC returns to the Portugieser collection's historical roots with their Portugieser Chronograph Classic. With a case diameter of 42 mm, the wristwatch is a millimeter larger than the standard chronograph model (reference number 3714). The case is available in stainless steel or 18-karat red gold. It's also 2 mm thicker than the standard version with a thickness of 14.5 mm. The dial is silver or ardoise, and IWC uses Arabic numerals for the hour markers. One special feature is the minute track on the dial edge. It's reminiscent of a railway track, recalling the design of historical pocket watches. The minute graduation used to be widely used by watch manufacturers. The German luxury watch manufacturer A. Lange & Söhne still uses this design on some of their models. The small seconds is located above the six o'clock position on the Portugieser Chronograph Classic. The date display window is at three o'clock, while the timed hours and minutes subdial is below 12 o'clock. You can time up to 12 hours with this chronograph. Unlike most chronographs, however, you can read the timed hours and minutes on one subdial like the regular time. The sapphire glass on the dial side is domed on the edge and has double anti-reflective coating. The sapphire glass on the back side of the case allows a clear view of the movement. The alligator leather strap is either black or brown and is produced by the Italian luxury manufacturer Santoni. The in-house caliber 89361 powers the Portugieser Chronograph Classic. The automatic movement has a power reserve lasting 68 hours. It also features a flyback function.